Everyone knows that Boris Karloff played the titular character in The Mummy back in 1932. That same year, he also stalked about an Old Dark House, and both films have gone on to become horror classics. 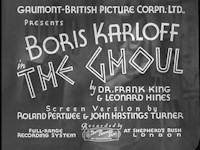 One year later, worlds collided in a sense when the Gaumont British Picture Corporation loosely adapted the 1928 novel The Ghoul, a tale about a criminal mastermind who maneuvers his victims to acquire a diary. The 1933 film of the same name dispensed of much of the novel’s plot, keeping only the basic “old dark house” premise and interjecting the story with a dose of Egyptian mysticism. It’s a combination that’s a perfect set-up for a good old fashioned horror film, especially when you toss in Karloff in the titular role. Professor Morlant is on his death bed, but he’s not without a back-up plan. Having dabbled in mystical, Egyptian arts, he concocts a scheme involving the “Eternal Light,” an amulet that will grant him eternal life once he offers it to Anubis in death. Vultures are circling however, as several people surrounding him want the amulet themselves. Surprisingly enough, his seemingly loyal butler manages to pry it from Morlant’s dead hand inside of a fuax-Egyptian tomb. Meanwhile, two cousins who were related to Morlant get caught up in the squabble due to their inheritance. Eventually, everyone converges on the Morlant estate just in time for the now undead master’s re-arrival. I bought The Ghoul for about five bucks some time ago. It was a title that was obviously intriguing for the Karloff factor, but I never got around to watching it until recently. I’m glad I finally decided to dust it off because it was certainly worth the low price tag and more. It’s just a good, vintage little creep-fest that operates on the most simple of levels (as most gothic horror does). Sometimes, all you need is some stark lighting, spooky sets, a classic monster movie score, and one vicious monster. Of course, it helps if said monster is portrayed by one of the all time legends of the genre, but I digress. This is good stuff, and feels a bit unique considered it’s cobbled together from so many sources. It’s not quite a proper mummy or zombie film, but it does have the familiar trappings of an “old dark house” mystery film at times. I’m probably overstating the simplicity of the plot a bit; in fact, one might say the film is a bit over-plotted and a bit plodding in the early going. After Morlant croaks, there’s a lot of mechanisms at work to get everyone back to his mansion for the big climax. The plot even manages quite a few twists and turns that reveal that the plot wasn’t exactly as we thought. It’s not one of those crippling twists that void the rest of the film (though the explanation behind Karloff’s resurrection is a bit of a cop out), but it does do a good job of turning the film on its head a bit. You’ll learn that just about no one is quite as they seem, and the whole film is built on a series of deceptions that are revealed throughout. It actually does end up feeling more like a creaky old mystery film than it does a monster movie at the end, but it works well enough. It manages to pull off the mash-up pretty well mostly due to the overall mood and atmosphere. These old gothic tales just seem to have a little bit of extra flair in all their black and white glory. The use of light and shadows here is excellent, and the various sets establish the proper mood. There’s a moonlight funeral procession that’s pretty eerie, and the mansion itself is full of sharp angles and is constantly bathed in shadows. Then there’s the monster itself. While Karloff’s deformed visage isn’t as iconic as the Frankenstein monster, it works well because it is unsettling. Karloff’s performance doesn’t merely ape his most famous role either--he lurches about, but there’s something a bit more frantic and vicious about the way Morlant moves throughout the house, terrifying his victims. 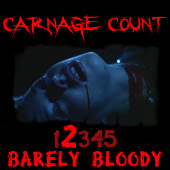 I was also surprised to see that, unlike most films of this era, there was a bit of bloodshed. It’s not much--a bullet grazes the head of a character, and Morlant carves an Egyptian symbol into his chest--but it is noticeable. The cast surrounding Karloff is good too. Harold Huth is especially enjoyable in the role of a con-man who convinces the rest of the guests that he’s an Egyptian sheik and an old acquaintance of Morlant’s. I suppose the two cousins, portrayed by Hyson and Bushell, are the main characters, and the chemistry between them is pretty good. There’s actually some pretty witty interplay between the two in the form of some sharp dialogue. I’m not sure the same can be said of Harrison’s character, Kaney, who provides the film’s somewhat ditzy comic relief. She’s a bit of an odd fit, considering the somewhat foreboding surroundings, as she skulks about the mansion making silly observations and comments. It’s an odd tonal clash that kind of makes the film seem a bit sillier than it should at times. Director Hunter keeps the action moving well enough, and the film actually feels a bit advanced in the sense that there’s not a very staged quality--there’s a good amount of cutting between the action at different sets that keeps the pace up. The Ghoul was actually a lost film for quite some time. It was re-released in 1938, and then disappeared until a print appeared in Czechoslovakia in 1969, and even then the film was heavily edited due to the violence. Amazingly enough, a pristine, uncut print was found in a forgotten film vault in Shepperton Studios during the 80s, and that’s the one that showed up on MGM’s DVD release in 2003. It’s an amazing restoration, and stands as one of the best I’ve seen from the era--the black and white photography is rendered well, yielding a nice contrast between the lighter hues and the deep blacks. The sound is similarly very clear, and not the least bit muffled. There’s no special features, but it’s hard to complain about that considering the film could just have easily been lost forever. If a film like this starring Boris Karloff could suffer that fate, it really makes you wonder just what else might be out there, waiting to be discovered. At any rate, The Ghoul makes for a pretty decent revelation itself. Dig it up sometime, but make sure you pay your dues to Anubis first. Buy it!